10 It’s Time For War! 11 Are You Sitting Down? Healing and peace – Please pray that john gets a miracle and getting his daughter back home safe and Happy. Bring joy to this family. God’s Divine Intervention – God please forgive our sins and help us resolve our employment and everyday life challenges. Help and Mercy – Oh Lord in Jesus name,please rescue my husband from his current unemployment predicament. I need your mercy and help in this area. Broken – I just need a prayer for me and my family. Pray for My Son – Please help my son he is being destroyed by his current siuation with his family. Praying for dad – Please pray for my dad as he is entering his second time chemo treatment for lung cancer that has returned. Thank you so much. 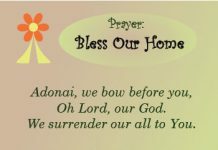 Prayer for home buying – We need your help in prayer that our offer for a home is accepted and it goes under contract and everything is smooth. Healing – Please pray for my son Michael, please ask God to heal him and remove his anger. Pray for My Son – Please pray for my son. He faces many challenges. Help him to face these with emotional wellness. Prayer for my family – my family is in trouble some unknown person came and threaten to kill and demanded money. Family conversion – for my family for guidance and protection. may the father continue to bless us and strengthen us, that we may experience his calling to conversion. Family peace and happiness – Pray that my mom will forgive and listen when we try to help her. Pray for happiness again with extended family. More Love for family – Pray for my sister, she has a lot of hatred in her heart. Love and Hope – Lord in Jesus name,please help my family. Grace and Mercy – Lord in Jesus name,please give my family Grace and mercy. Family – Please help me in prayers for my family, and for my New born baby Boy. Success to my son and husband – My sons success for 100 percent scholarship and my husband’s continuous success. Miracle – Please pray for my husband and I , that we receive we are praying for. Finances, home & employment. Dad – My dad is going for several tests today regarding his heart. Please pray for a good outcome. Please pray to save my mother’s soul. – Please pray to save my mother’s soul. Employment miracle – Ohh my lord. I desperately need you guidance and employment support for my husband. Family Unity – Pray for me, my husband & my daughters understanding of each others needs and for our unity as a family! Please pray to save my mother’s soul – Please pray to save my mother’s soul. For our family – For my family…..me, my husband and our children relationships with each other. Own house – Please pray for a own house. Please Uphold us in your valuable prayers. Pray for peace of mind. Family Mending – Please pray for my family reconciliation. Much anger and dismay. Pray the Holy Spirit will touch each heart to find love and forgiveness. Thank-you! Family – Please pray for reconciliation and peace in my family. Children and grandchildren struggle with life’s challenges. We need your help Oh God. Pray for my family – My dear God Jesus please guide us through this difficulty we are going through, we need guidance at this time and always amen. Salvation for lost family – Pray for my husband and sons to receive salvation in Jesus’ name. Thank you very much. Buy house next to Aunt B – Please pray for my family to be able to purchase our home next door to Aunt B.
want my brother Suyetharan to break up with Inthumathi – Dear God, Please God make my brother Suyethara break up with Inthumathi please God make it come true very very very soon…..
Healing and Restoration of family – Please pray for healing and restoration of my family, from generational curses and effects of demonic attacks and curses. Amen! Health, wealth protection to my family – Save, protect my family from everything, and remove anxiety from me dear lord please help me. Peace of heart – Please pray for my family for peace and Harmony. Help them find employment and the will to change. Prayer for money – Lord please give me some money to pay my loan and doing a new business for my family. God please help me immediately. Father in law be baptised – Please pray that my father in law may be baptised and come nearer to our Lord. He is a believer but is reluctant. I want money for my family – Dear god help me please. I lost my business. I want money emergency. Unite my Family – I want God to help unite my siblings , teach us to forgive and love ourselves. I want money for my family – Dear God, I lost my business, help me money, I have no property to sell & fill it, I will do something.please help me. Prayer for my son Waryee and Addelia – Lord Jesus Christ ,Help my son Wary and Addelia to have Marriage Blessing the Catholic in Jesus Christ. Amen. Please Lord, help my daughters and I to forgive – Please Lord, help my daughters and I to forgive and to heal from past arguments. Help bring us together as a family should be. Please pray for my marriage – Please pray for my marriage. I don’t want a divorce. I want my husband to stop the games and come home. Child custody – (Ca) please pray for my brother his girlfriend has taken their 1.5 year old daughter to an unknown location he is very upset. Family is the most important thing in any man or woman life. Family is the first source of support and security, love and understanding, protection and help in any human life. It doesn’t matter where you are at the moment, you always know and have a feeling, that you can go back to your family home. If you have family, you will never feel alone and lost in the world. It is necessary and very key that our families remain and progresses in Christ. The only way to achieve that is by constantly speaking prayer for my family protection and peace together with other family members or just sending prayer words from your heart to your family members. Dear Lord, I thank you for my family and for the health you have given us. I thank you because you are always with us. May your presence and your mercy never depart from us in Jesus name. Dear Lord, in Joshua 24:15, Joshua declared that he and his family will serve the Lord. Father, I pray that my family will not be led away from you. I pray that every single member of my family will be kept under your banner and in your refuge and that we will always serve and worship you in Jesus name. Dear Lord, I pray for peace and protection in my family. I pray that we will make good strides and we will not stumble. I pray that we will have good success and that we will not fail at whatever we put our hands to do. Dear Lord, I ask for your grace and your protection for every member of my family. I ask that your grace will open doors for my family and give us numerous breakthroughs. 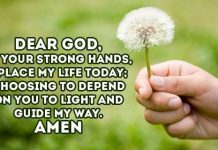 Dear Lord, I pray for your financial assistance in my family. I pray for assistance in any we may need it. I ask for your provision and I pray that you keep us from lack in the name of Jesus. Father, I pray that you will keep my family strong to pray and not to faint. I pray that you will give us the peace and grace to pray without ceasing in Jesus name. Amen. What is prayer for my family? Prayer for my family is supplications, declarations or utterances made for your family. When you say a prayer for my family, you are interceding or standing in gap for your family. Prayer for my family protection and peace is quite important. It reminds your family of the God they serve and keeps them constantly in tune with His word. Prayer for my family also has the effect of positively affecting family members by God’s grace, since God answers prayers. Only by praying it is possible to reach peace, progress and any positive impact on your family. Genesis 25:21-22 says, “Isaac prayed to the Lord on behalf of his wife, because she was barren. The Lord answered his prayer, and his wife Rebekah became pregnant”. 1 Chronicles 16:43 “Then all the people left, each for his own home, and David returned home to bless his family”. 2 Timothy 1:16 “May the Lord show mercy to the household of Onesiphorus, because he often refreshed me and was not ashamed of my chains”. Endeavour to say a prayer for your family protection and peace every day, every now and then. Ask your family members to do the same. Let it be that important to you and you will see the changes you desire in your family in Jesus name. Remember the saying: “Family which prays together, stays together”. What could be more important? Good day! I am Cezar Yriarte, I am working in Kingdom of Saudi Arabia and I am with a community of Couples For Christ CFC Servants of the Lord SOLD, a kind request to you, Matter of days you are going to the Philippines in Gods will, Please pray to our Lord Jesus Christ to touch and heal the heart of my Wife Emily Ojeda Yriarte to accept my Love to her and reunite us and give a chance in our marriage, I love my family, my children Ana, Karlo & Aldric as I Love my wife so much. Im hoping and praying that God will make a way. Please guide my wife and my children in the right path in their good life. FORGIVENESS ARE GREATER THAN VENGEANCE COMPASSION ARE MORE POWERFUL THAN ANGER. Thank you so much LOLO KIKO for reaching us and may the Lord Jesus Christ reign the Love and Forgiveness in our Heart always. God Bless the People of the Philippines and the World. Kindly address this to my Family.